Consumer Alert – Uber Drivers and Passengers | Inabnitt Agency, Inc.
Everybody has heard about Uber and the services it offers. 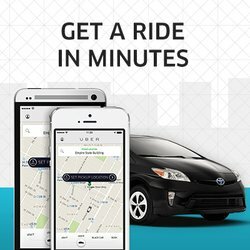 Many people have used Uber or have thought about using it. Great way to get around without having to wait for a Taxi. Great way to make extra money. Uber states “Drive with Uber and earn great money as an independent contractor. Get paid weekly just for helping our community of riders get rides around town. Be your own boss and get paid for driving on your own schedule”. All that sounds great but………. How does that effect your insurance? The Indiana Department of Insurance recently issued a consumer alert to make consumers aware of the potential hidden insurance risks of transportation networking companies or ridesharing services. Did you realize that most standard personal auto policies contain exclusions when a person uses their personal vehicle for commercial purposes? Did you know that if you’re a passenger in the car and injured in a collision, the driver’s personal auto policy probably won’t cover it? Read the whole article Here then if you have questions please feel free to call us and we will be happy to explain this to you and advise you of the best way to be covered if you are a Uber driver. Copyright © 2013 by Inabnitt Agency, Inc.